Hydrogen Peroxide is produced in biological systems by controlled pathways at low concentrations that impact on cell signaling. At higher concentrations inflammatory cells produce local intense amounts of this oxidant to kill pathogens. In the progress of human disease, uncontrolled formation of hydrogen peroxide from the mitochondrial respiratory chain and enzymes, such as xanthine oxidase, can occur (Prof. Victor Darley-Usmar, Univ. of Alabama, personal communication). Despite the recognized importance of this oxidant in biology real-time measurements at low concentration have been difficult. The hydrogen peroxide sensors developed by WPI are designed to compliment existing high sensitivity fluorescent approaches with direct quantitative measurement in biological samples in the low nM range. Four hydrogen peroxide sensors are currently available. The ISO-HPO-2 is a 2.0 mm stainless steel sensor, with replaceable membrane sleeves (#600012) and an internal refillable electrolyte (#100042). The sensor is designed for use in cell cultures and similar applications. 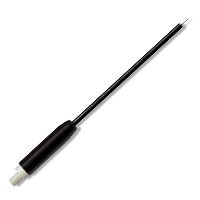 The ISO-HPO-100 is a 100 micron tip diameter hydrogen peroxide micro sensor designed for use in tissues and similar applications. The sensor design is based on a flexible “activated” carbon fiber sensing electrode coated with a proprietary membrane that enhances hydrogen peroxide detection. Our hydrogen peroxide (H2O2) sensors work with the TBR4100 and TBR1025 free radical analyzers.